I was given this sweet blog award by Katie of "Playing for Him." Thanks, Katie! 2. 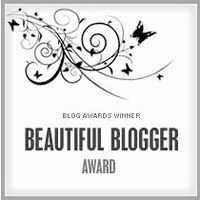 Copy the award and paste it to your blog. 3. Tell us seven interesting facts about yourself. 5. Contact your nominations and let them know they’ve won. 1. I love children's literature. If I put it that way, it makes me sound like a mildly intelligent college student. To put it bluntly, I love kids' books. Picture books, chapter books, stuff like that. I actually took a children's literature class this past semester that I loved. And I only feel slightly geeky and self-conscious when I look through the children's books at a bookstore. I just finished reading the classic "A Little Princess," but more on that in a later post. 2. My family is a little strange (by the world's standards). We are farmers and believe in healthy, all natural foods and try to raise products like that. We also try to support local businesses and growers. My dad has a deep dislike of Walmart and that dislike is gradually spreading to me and my mom, too. 3. I am slightly obsessive about certain things. I alphabetize my CD collection and my bookshelf (or at least it was until I went on a book buying spree recently and ran out of room-now things are crammed everywhere). I always put three pieces of ice in my water glass (I have a perfectly logical reason for this...or at least I claim to. I want my water nice and cold, but if I put more than three pieces, all of the ice comes sliding to my face and I end up with water all over me). I love routines and schedules and feel lost without them. 4. I don't drink soft drinks. I used to drink at least one a day. A few years ago, I went two weeks without drinking any soda for a Brio 30 Day Challenge, and when I tried to drink a Sprite after that, it was so sweet that I nearly gagged. I haven't had any since then. And that's a good thing...those things are so unhealthy! Did you know that there are 12 teaspoons of sugar in a 12 ounce can of soft drink? 5. I don't wear make-up (but I don't believe wearing it is wrong). First of all, I just think it takes too long to put on and I like to be able to get ready quickly. Also, the few times that I have worn it, I've been so paranoid that it was wearing off or starting to look funny. And I just want people to see me for who I really am. I don't want to have to worry about someone (like a guy) seeing me without "my face on." I'd rather just wear it for very special occasions. 7. I love "Full House." I am a child of the 90's who grew up watching reruns of this show. I embrace its cheesiness, and I still have a crush on Uncle Jesse (I saw this young Italian guy-well, I assumed he was Italian, since he worked at an Italian restaurant- the other day who looked like a young John Stamos-minus the mullet- and I almost swooned). Yes, I even love that cheesy music that happens on every single episode when Danny has a heart-to-heart talk with someone in his very large family. 1st, that whole make up thing..totally me. I ALWAYS feel paranoid when I do wear it on occasion for the same reason. 3rd, the dark one---haha..I used to sleep with the computer light and a night light! haha, I'm proud of you for limiting..although it's hard for me!! okay, 4th..I had to laugh at the one about Full House..the music when Danny makes up with his daughters, haha! priceless! Sorry for putting 3rd!!!! i accidentally put that! Congrats! Also I like that song by Eisley. My family is the same about eating healthy, natural foods. And when I bake, I always to if from scratch. I also don't like wearing make-up; and for the same reasons! And thanks for awarding me! I have to sleep in complete darkness! If I don't I will never fall asleep! Nu uh! I love that movie! Can't wait!